FBI: "Limiting honest dialogue ... is generally not an effective advocacy strategy"
Statement expresses fear that FBI "programs are quelling lawful dissent"
(CNN) -- Ten U.S. Muslim organizations threatened this week to cease working with the FBI, citing "McCarthy-era tactics" by the agency, including efforts to covertly infiltrate California mosques. 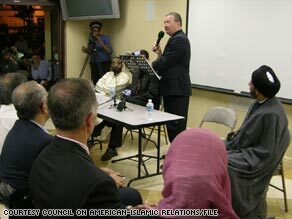 Stephen Tidwell, then of the FBI's Los Angeles office, speaks at the Islamic Center of Irvine in 2006. "Limiting honest dialogue, especially when complex issues are on the table, is generally not an effective advocacy strategy," spokesman John Miller said in a statement. "The FBI has continued our outreach efforts, across the board, with a number of concerned groups and where we agree -- or disagree -- most have concluded the best results are achieved through continued conversation. We believe that, too." The group's statement, dated Tuesday, said several incidents of the FBI "targeting Muslim Americans lead us to consider suspending ongoing outreach efforts." The statement was issued by the American Muslim Taskforce on Civil Rights and Elections, whose director, Agha Saeed, couldn't immediately comment because of a family emergency. The FBI has sent "agents provocateur" into California mosques, according to the statement, which says an FBI agent threatened to make one mosque member's life a "living hell" if he did not become an informant. Though the statement does not name the mosque member, the Council on American-Islamic Relations said last month it would seek an investigation into the February 21 arrest of Ahmadullah Niazi, an Afghanistan native. "Mr. Niazi previously reported to [CAIR's Los Angeles office] and other community members that, during a raid of a friend's house, an FBI agent urged Mr. Niazi to work with the agency, saying that if he refused to cooperate his life would be made a 'living hell,' " a news release said. Niazi, a member of the Islamic Center of Irvine, told CAIR his arrest was retaliation for his refusal, the release said. The FBI directed questions about Niazi's arrest to the U.S. attorney's office in Los Angeles, California, which declined comment. Niazi, 34, was indicted last month on charges of perjury, procuring naturalization unlawfully, using a passport procured by fraud and making false statements. A search warrant for Niazi's Tustin, California, home said Niazi became a naturalized citizen in 2004 and made false statements about his past aliases and international travel. He also made false statements about contact with his brother-in-law Amin ul-Haq, the indictment said. Ul-Haq is said to be Osama bin Laden's security coordinator and has been labeled a "specially designated global terrorist" by the U.S. government, the indictment said. An FBI agent said in open court that Niazi also had discussed terrorist plots with an undercover informant, according to media reports. Niazi has pleaded not guilty to the charges against him. CAIR's problems with the FBI began before Niazi's arrest. Last year, the FBI discontinued its "formal contact" with CAIR. The Tuesday statement said the FBI unjustly designated CAIR and other organizations as "unindicted co-conspirators" in the Holy Land Foundation case. A jury convicted Holy Land Foundation leaders last year of conspiring to support terrorism and launder money for a terrorist group. "Making this unjust designation public violates the Justice Department's own guidelines and wrongly implies that those listed are somehow involved in criminal activity," the statement said. The FBI's Miller declined to comment on specifics, but said the FBI wants to avoid "formally constructed partnerships" with CAIR. "Our concerns relate to a number of distinct narrow issues specific to CAIR and its national leadership," Miller said. Before the FBI severed formal ties, CAIR officials had met with the FBI to discuss hate crimes targeting Muslims. On occasion, CAIR offered assistance in investigations. The group also held training sessions for FBI agents on Islamic culture and ways to improve interactions with the Muslim community. CAIR this week called the FBI allegations a "campaign of smears and misinformation," a remnant of the Bush administration. "It is not surprising that we would be targeted in a purely political move by those in the previous administration who sought to prevent us from defending the civil rights of American Muslims," said a statement from the group's national communications director, Ibrahim Hooper. Tuesday's group statement also mentioned "a flourishing of anti-Muslim activity" during the previous administration and expressed fear that "counterintelligence programs are quelling lawful dissent." Unless the FBI affords fair treatment to all mosques, Muslims and Muslim groups, the statement said, Muslims should consider suspending ties to the agency. "This possible suspension, of course, would in no way affect our unshakable duty to report crimes or threats of violence to our nation," it said.